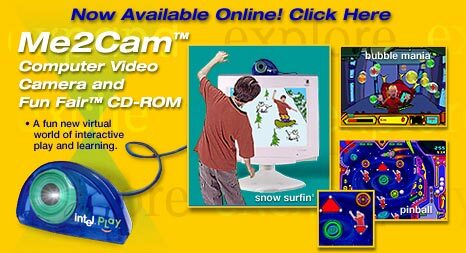 Kids have always wanted to see themselves play inside a computer game, and now they can with the Me2Cam™ Computer Video Camera and Fun Fair™ CD-ROM! The Me2Cam™ and Fun Fair™ CD-ROM is a revolutionary new system of play that lets kids go inside the computer game and interact with a virtual world. No mouse is needed since kids will use their bodies to make things happen inside the games. With the Fun Fair™ CD-ROM, kids will be able to race down a wacky mountain as they go Snow Surfin', play exciting body pinball, have a blast popping bubbles in Bubble Mania™, get groovy with the band in Club Tune™ and have fun morphing in the Fun Zone™! It's a whole new way to play where kids are the stars! A whole new fun and interactive system of play! The child is INSIDE a virtual world! Kids' bodies control the action in the game. Print images of the child in action as s/he plays the game! Great multi-level game play–easy to learn, hard to master.